Answer: American Express has been very successful with target modeling, as have other companies. But you know, I go to conferences, and I don’t see any proof. Why haven’t I seen proof? Because we’re all in competition, and showing proof is sometimes difficult. To show an example where I succeeded, found something that has really worked for American Express, and to present that to CIBC or to the Bank of Nova Scotia is probably not a good idea. Bill Comeau is right. As one who lectures and writes about database marketing, I am always looking for proof. Unfortunately, most people can’t or won’t provide it. Paul Wang and I spend many days meeting with marketing professionals from major companies in the seminars we run six times a year. We listen to their experiences. It is clear that in many companies, database marketing is working and producing customer satisfaction and profits. It is also obvious that in many cases, it is not working, and that companies are wasting their money. Some marketers have been willing to share their data, so that the state of the art in our industry can be enriched. One of these is Max Grassfield, owner of Grassfield’s an upscale men’s clothing store in Denver. Max founded the store 35 years ago, and is still at it. In this period of time, he has not only become a great retailer, he has developed into a skilled database marketer. He calls his system “Invitational Marketing™”. It is based on the proposition that “business goes where business is invited”. Max issues personal invitations to his store to a carefully selected group of individuals in the Denver area. His method works. In this article, we will cover the techniques that Max uses, the theory behind his methods, and proof that it is working. Let’s begin with the theory. Most businesses lose between 15 and 20 percent of their customers each year. Retailers lose even higher percentages. From those loyal customers who remain, however, the profits can be significant. The acquisition costs of new customers, particularly for a small retail store, can be very high. Who pays these high costs? It is not the casual transaction buyers – here today, and gone tomorrow. They rarely pay for even the cost of their own acquisition. The real payoff comes from the loyal customers who, over a period of months or years, move up from being customers to becoming clients and even advocates. The goal, therefore, is to reduce acquisition costs – largely mass advertising – and spend the savings on retention – loyalty building communications. This what Max does. What is it that makes people loyal to a particular retailer? Is it the prices, the quality of the products, or the way that they are treated by the store? For discount stores, like Wal-Mart, the attraction is price. There are always transaction buyers – people who think only of price. They read the ads and visit stores only when what they want is on sale. They have absolutely no loyalty. If you are not a mass-market discounter, you cannot make money from such customers. Rather than kow-towing to these ingrates, it would be better to provide them with the telephone numbers of your competitors and invite them to take a hike. For a regular retailer to compete with a mass discounter on his own turf – price — is almost committing suicide. Product quality is important in customer retention, but only up to a point. When I was growing up, in the thirties and forties, we lived in New Canaan, CT. If we wanted quality products, we would take a day’s journey to New York where we could visit Bloomingdale’s, or Altman’s. Those days are over. I doubt that anyone in New Canaan is traveling to New York City today to shop. American retailing has become so advanced that most customers are within easy driving distance of a large mall or shopping center with a wide variety of stores having anything that they could conceivably want to buy. For every store featuring Hickey Freeman suits, there are a couple of others not too far away who have Charles Jordan or Joseph Abboud. It’s not the products – it’s the relationship with the institution and the sales people that keeps people coming back to a fine store. So, several years ago, Max Grassfield asked himself, “What can we do to make Grassfield’s unique?” The answer, which he evolved after much study, research, and effort was to develop methods to know his customers ” better than the other stores know their customers”. For the last ten years, Grassfield’s has been collecting a database of information on its customers, who voluntarily provide it. Originally, the data included name, address, telephone numbers, sizes, birthdays, and the wife’s name. He discovered that wives are often heavily involved in their husband’s clothing purchases. He is right. In my case, my wife Helena buys all of my clothes, so I understand Max’s thinking. Max collected information on all his customers – cash, check, and charge card – not just those that have opened a Grassfield charge account. He evolved a group of regular written communications with the customers on a one-to-one basis which use the customer’s first name or nickname (as the customer prefers), their sizes, wife’s name, product preferences, and references to what they bought in the previous season. Most communications are programmed to include messages designed only for the particular customer addressed: “I’ve been keeping my eyes on the 44 long suits…” Every letter is personally signed by the customer’s salesman who he met while visiting the store. For personal notes, he created a special half sheet (5 ½” X 8 ½”) letterhead bearing the Grassfield’s two-color logo in an A-2 envelope. To display the Grassfield’s merchandise, he developed an oversized (6″ X 9″) glossy photo postcard in full color. The text for the letters and post cards is printed on the store’s laser printer. Last fall he sent a wave of three different oversized postcards in one month intervals, to 4,100 regular customers. Each card greeted the customer by name, and was signed by his salesman. In November, he sent a special mailing exclusively to the wives on the database, which included eight color photographs on gate-folded heavy stock. The September letters offered $35 off on any purchase of $100 or more. There were 117 respondents (a 2.85% response rate) with an average sale of $451. It was an outstanding success. The final cost per piece mailed was just 48 cents including postage. For a $1,968 investment, he brought in $52,767 in sales. Compare that with the cost of full page ads which others are using to attract that type of business! In October, the messages featured the fall suit collection, referring to the customer’s size as well as his salesman’s personal day off: “Dear Arthur: With you in mind, I’ve kept my eye on 42 Longs…I’d like to show them to you. I’m here every day but Tuesday.” The P. S. offered “$50 off your purchase of a shirt and tie when you buy any fall suit.” The results: a disappointment. Thirteen transactions (0.32% response rate) with an average sale of $805 and a total volume of $10,470 – again for an investment of about $2,000 in communication costs. Not everything works. The November mailing to the wives was very carefully prepared. “Dear Connie (or Mrs. Rogers if she prefers that):..I have all of Fred’s sizes on file. ..All you have to do is select your purchase and we’ll handle the rest.” Grassfield’s offered to open a special charge account in her name, gift-wrap her selection at no change, and included a $20 gift certificate. The letter was mailed to three thousand wives. Ninety eight responded (3.27%) with an average sale of $324, generating a total volume of $31,728. The total November sales gain was 4% over 1994 which in turn was 20% over 1993. A great success. The October disappointment, however, resulted in an overstock of men’s suits which had to be dealt with. In December, Max selected eight suit sizes that were overstocked. Using the database, he drafted a special note to each customer whose size fit one of these eight groups. The incentive was $100 off any suit in that inventory, and $200 off the high-end Hickey Freeman suits. He mailed 1,164 invitations and sold 56 suits in 39 transactions. The average sale was $1,110 with a total volume of $43,307. The average mark-down per transaction was only 15%, far less than if he had waited for the annual January sale. In a December which was reported nationally to be a disappointing one for retailers, Grassfield’s reported a sales increase of 28% and closed the year with an annual sales gain of 7.2%. I’m told our kind of store is an endangered species, soon to be driven out by the big stores. I don’t believe it. I think there’s still a place for a store that knows you by name, keeps track of your sizes and style preferences, and keeps you informed of special events that will save you money. What do we carry? Suits and business attire by Joseph Abboud and Hickey Freeman, sportswear by Axis and Barry Bricken, shoes by Cole Haan and neckwear by Robert Talbott. And there’s more…lots more for you to discover on your first visit. The incentive? The enclosed $25 gift certificate. Come spend it in our store as if it were cash. No strings attached. We’re confident that when you do, you’ll sense the qualities that have kept Grassfield’s customers loyal for thirty-five years. P. S. In case you’re unfamiliar with the area, there’s a map on the back of the certificate. This letter was mailed twenty times over ten months. Over the ten months, he sent a total of 6,161 letters. One hundred and eighteen homeowners (1.92%) showed up to redeem their certificates, spending a total of $16,505, for an average sale of $139.88. But, more important, many of these people came back for a second visit. The database records all purchases. In subsequent sales from some of these 118 customers, Max realized $9,340 additional purchases – and, of course, that is not the end of the story. There will be many more purchases from some of these newly acquired customers in the future. Every one of the 118 newly acquired customers received a welcome letter, a brochure with the business card of their salesman. The customer services featured include “emergency tailoring (in our trauma center) while you wait, and without charge”. There is no Grassfield’s plastic card. Customers who have opened an account just have to say, “Charge it” and walk out with the merchandise. They don’t even have to sign a charge slip. If we sum up the ten month’s experience, Max has spent $2,957 to acquire 118 new customers who have spent a total of $25,845 thus far. If we can assume that Max has a 40% profit margin on his sales revenue, he has made a profit of $10,338 on his investment of $2,957 – a return on investment of 350% on his acquisition expenditures. Compare that with most retailers who are lucky to break even on new customer acquisition. In addition to the regular acquisition mailings over the ten months, Max tried two test mailings of a special new customer survey which accompanied the invitation. He sent out about a thousand surveys. The survey was not a success. It did not improve sales as well as the simple $25 offer. He did get a 17.8% response rate to his survey, however, and learned some valuable information. Sixty nine percent of the respondents shop for men’s clothing several times a year. Almost half of them buy two outfits per shopping trip. Sixty four percent take their wife or a friend along to help them with their selections. Sixty five percent have never established a relationship with a specific salesperson at the store. Most of Max’s respondents are between 35 and 44 years of age and have an income between $100,000 and $150,000. Finally, Max regularly mails reactivation mailings to lapsed customers who have not shopped after a period of time. The database dictates who gets these messages. Max is able to measure the return on investment for each project. He is in a position to determine the lifetime value of his 4,100 customers. He has the data needed to append Recency Frequency Monetary (RFM) codes to his customer base. He can determine who are his best customers so that he can give them extra special services and recognition. His database has become a powerhouse of information that he uses to generate customer satisfaction, loyalty, and repeat sales. Max Grassfield’s experience shows us this: database marketing is not just something for American Express and American Airlines. It can be made to work well for a small retail store. It is possible to make extremely profitable use of a personal computer to keep track of the preferences and buying habits of four thousand customers, and to communicate with them on a one-to-one personal basis which customers appreciate, and which produces highly profitable results. That being the case, why aren’t more retailers — both large and small — doing what Max has been doing for the last couple of years? It’s not because they haven’t read about it. This article you are reading now is certainly similar to others that you have read elsewhere. What is the problem? I think it is because setting up a database, and dreaming up communications like those that Max has devised, writing the software necessary to create the personal references in the letters – all of this is a lot of work. It is complex. Max told me that the program to write just one of the one-on-one letters shown here takes 300 lines of computer code. That is 300 lines to write, and debug when something goes wrong – as it always does. Max had to design the database, and see that data is constantly being collected and stored in it. The database has to be constantly updated as people move in and move out, get married, get divorced, have children, stop coming to the store. This kind of work calls for dedication, drive and a lot of imagination. It is a lot easier (but much less profitable), to sign a contract with an ad agency for full page ads in the local newspapers. To do database marketing, the owner of the store has to get religion – as Max has – and do a lot of the work himself – or find a creative person on his staff who can do it. The sales force has to play a role in these communications – signing the letters, and making suggestions for new ways to please the customers. So, you have the proof. You can see that database marketing can be used profitably to acquire customers and maintain their loyalty. Of course, we have special circumstances here. Max is the owner of the store. He has an entrepreneurial interest in the outcome of his loyalty building efforts. He has become adept at using his personal computer and laser printer, and he is very creative. He likes to collect statistics to measure his success. How can you do what Max does? I think that there are several rules you must follow if you are to be successful. Build a database and develop methods for capturing customer data. 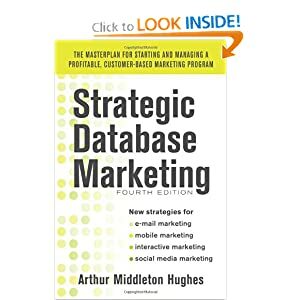 Involve everyone who has any customer contacts in the care and feeding of the database. Find a way to give your Director of Database Marketing the entrepreneurial drive that Max has. Make part of her compensation based on an objective measurement of her success in building long term customer relationships. Educate your top management, and all customer contact personnel concerning the objectives of building up customer loyalty. Make the retention rate as well known in the company as the sales rate.